If you loved Top Gun but always wanted more, then you will love this series. It has the best aerial battles I�ve ever seen, with some compellingly beautiful shots depicting the planes in various stage of battle. I couldn�t take my eyes off the screen, and sometimes forgot to listen to the plot half the time, due to the jaw dropping backdrops. Yukikaze tells the tale of mankind against an alien menace called the JAM. Humans have moved the battle to the JAMS home planet, and this battle mostly takes the form of aerial combat. The main protagonists for the humans are a man named �Lt Rei Fukai� and his machine �Yukikaze�. 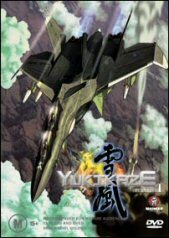 Yukikaze an advanced jet plane that seems to have gained sentience at some stage. Yukikaze is what is called a Super Sylph which is a futuristic looking machine kind of like a next generation Robotech fighter. The Human forces that fight the JAM are called the Fairy Air Force (hmmmm). The JAM are an unknown quantity to the humans in this battle as they have never been recovered, but the increasing number of losses on the part of the humans has forced them to look at automated planes that will replace the human pilots. The first episode starts out with a background explanation on the war, how it started and where it is currently at. We see Lt Fukai shoot down what looks like another Super Sylph, but Yukikaze correctly identified it as JAM. Rei is given some time off for an inquiry, and in the meantime an automated plane is developed. While on leave we get to see the sparcity of human connection Rei has, which is evidenced by a drinking session with Rei and his boss (Major or Jack). Rei is somewhat of a loner, who is fanatical about his ship and not well liked by the other pilots. He also does his best to keep everyone at a distance, but this very trait is what Yukikaze appears to have chosen hum for. None of the other pilots know that Rei believes Yukikaze is sentient, and this is only admitted to the Major. Rei�s leave finishes up and he starts doing some test fights against the unmanned fighter. Rei loses the practice engagements, adding to his considerable frustration about being replaced by a computer. The JAM ersatz Super sylph appears again and takes out a few other aircraft causing Rei to go after it. He loses the engagement, and in the process takes down the unmanned aircraft. He is then taken to a dreamlike airbase which is actually a JAM deception to gain an insight into the way humans are conducting their warfare. Rei escapes and on subsequent flights Yukikaze takes out a JAM base even though it is thought to be a human outpost. This brings Rei into even more question, and he withdraws even deeper into himself. Here the DVD ends leaving some pretty big question left unanswered and leaving me hanging for the next release. If you intend to watch this series, I would suggest watching this DVD twice. Once to sit back and enjoy the incredible scenery, and the second time to let the plot sink in. Some pretty common but moving themes are touched upon by this DVD. Change, isolation, happiness and comradeship are handled quite well, and create a tension between characters which is almost palpable. Final analysis: If you are not a fan of thought provoking themes, but you like action then this film would rate an 8/10, but if you like philosophical plots with insane action then you cannot go past this film. 4:3 Full frame ratio, with exceptionally crisp images. It is so clear that if you freeze it in some places you can see exactly how they have overlaid the animation over the computer images. The characters themselves are simplistic, but at least are in proportion. The very first lady we seen in episode one looks like she has massive bags under her eyes, almost like they have got an intern to render the character. The other females in the show don�t fare any better, but it these are only small problems. English 5.1 with signs or words only. The sound effects in this series were brilliant. Yukikaze has a combination of real effects from the Japanese Air Forces, mixed with some spooky at music at the right time to create a really creepy feel to some parts of this series. I was pleasantly surprised by the fact that there was very little of that crappy glam guitar music that plagues most Manga. The English translations were clear, but the written and spoken versions were consistently different. - Making of documentary: an interesting look at the process of making the series. - Madman Propaganda- Blue Gender, Geneshaft, Kiddy Rade.